With apologies to cat lovers everywhere, time and again we see proof that there is more than one way to skin a cat. One example is in the innovative way new technologies have redefined oil production and the entire industry. Until recently, the price of oil was controlled by the Organization of Petroleum Exporting Countries, which gave a handful of oil-producing nations geopolitical leverage over the rest of the world. But several new occurrences, including the shale oil revolution in the United States, have dramatically altered the global energy landscape. For now, there is a “new oil order” spurred by technologies that have proven to be transformational. Horizontal drilling and hydraulic fracturing have pushed U.S. oil output to its highest level since the 1980s. OPEC now is afraid that demand for its crude will keep falling as North American supply grows and makes its way to the global markets as U.S. export barriers fall. Hydraulic fracturing is one reason for the shift—and some of the leading experts on the technology will convene at ASME’s Hydraulic Fracturing 2015 conference in Houston this month (visit asme.org for details)—but the process of extracting oil this way has not been met with universal endorsement. Critics mostly worry about water. 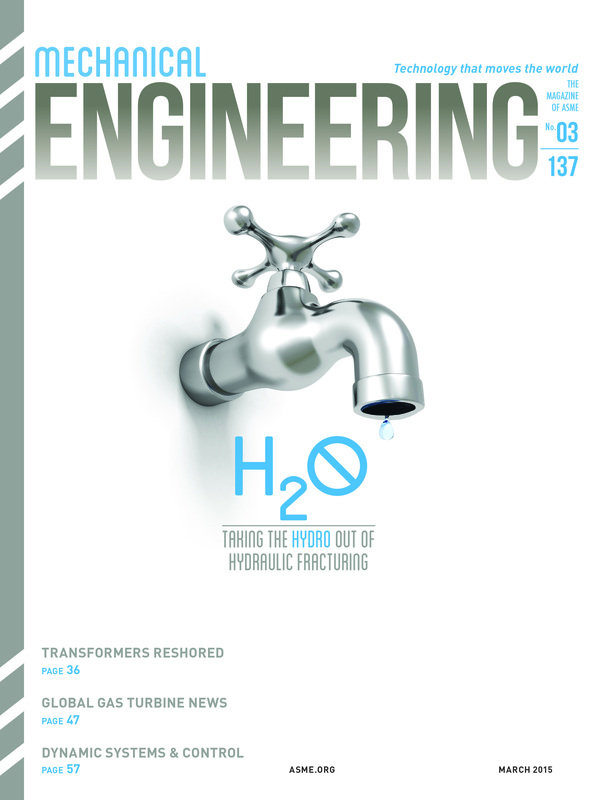 Contributor Mark Crawford points out in this month’s cover story, beginning on page 30, that a typical hydraulic fracturing job requires between 2 million and 5 million gallons of water per well. The problem that emerges from this is twofold. First there’s the issue of depleting groundwater resources, and then there is the fear that the chemical alchemy that is poured into the water to reduce friction and the growth of bacteria and corrosion will pollute local aquifers. A solution may be in sight as some companies have found ways to “frack” with less water or no water at all. But Crawford reports that less than 3 percent of the fracturing jobs in the U.S. are waterless. That could change if U.S. companies take a page out of Canada’s playbook, where about 25 percent of the fracturing jobs use waterless processes. Technologies such as hydraulic fracturing are evolving as engineers continue to search for better ways to extract oil, build up supply, and reduce reliance on OPEC. To me that’s an example of using technology innovation to re-skin a timeworn economic model. Robert E. Nickell, the long-time chair of the Mechanical Engineering Magazine Editorial Advisory Board, an ASME past president, a devoted and engaged volunteer of the Society, and a friend, passed away due to complications related to a recent battle with cancer. Nickell’s contributions to ASME and to global safety standards cannot be overstated. He was a man whose intellect was matched only by his leadership, his wisdom, and his passions. He was passionate about his family and his friends, as well as his beloved profession and ASME. It is often a cliché to say that one individual truly touched many lives. In the case of Bob Nickell, the statement could not be more fitting. Those of us who knew him feel a deep personal loss. To read more about Bob visit asme.org.